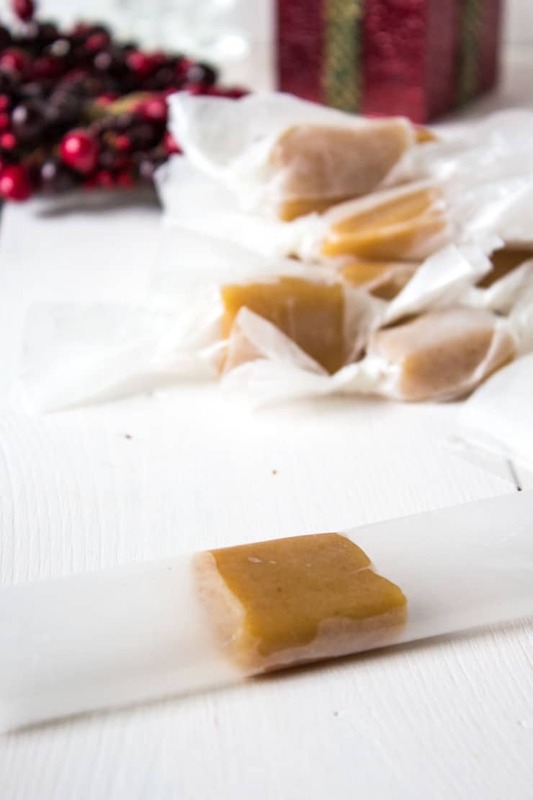 Soft and chewy homemade caramels are a perfect treat! These are a family tradition. My mom has made homemade caramels for years. She still makes several batches of this delicious caramel every year! 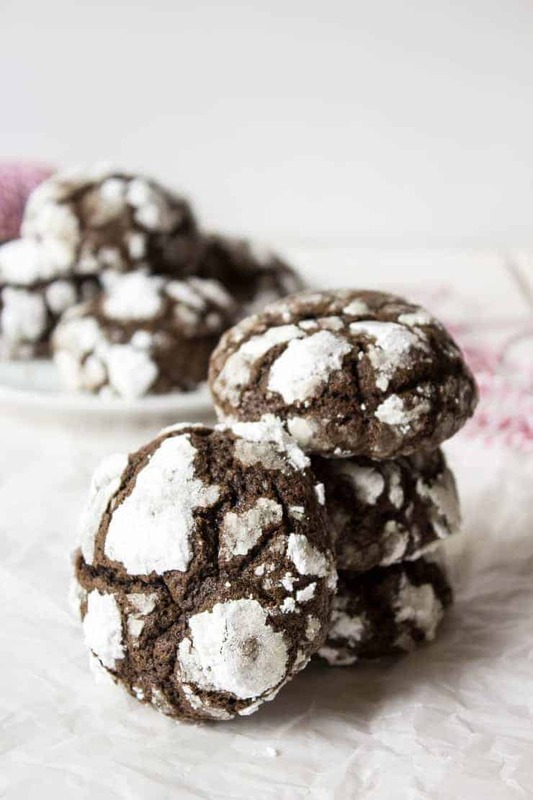 They are treats for the family and gifts for co-workers and neighbors. 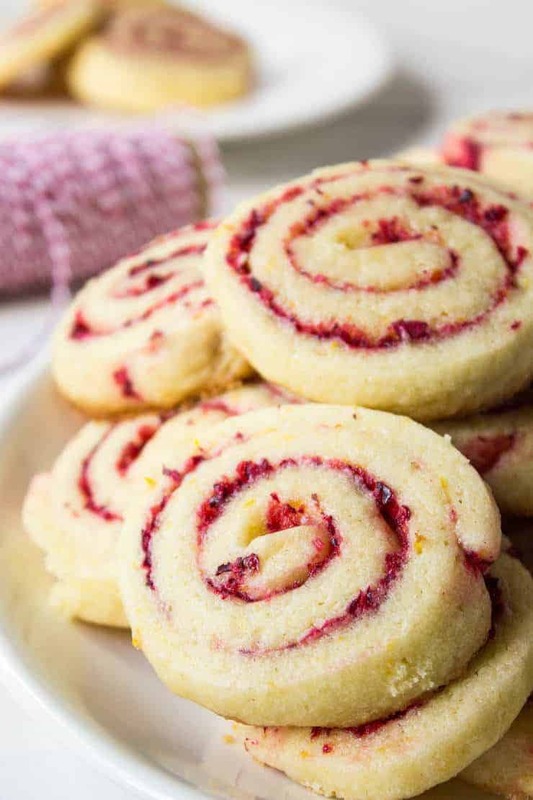 When I moved away, I realized I needed to make these delicious treat too! 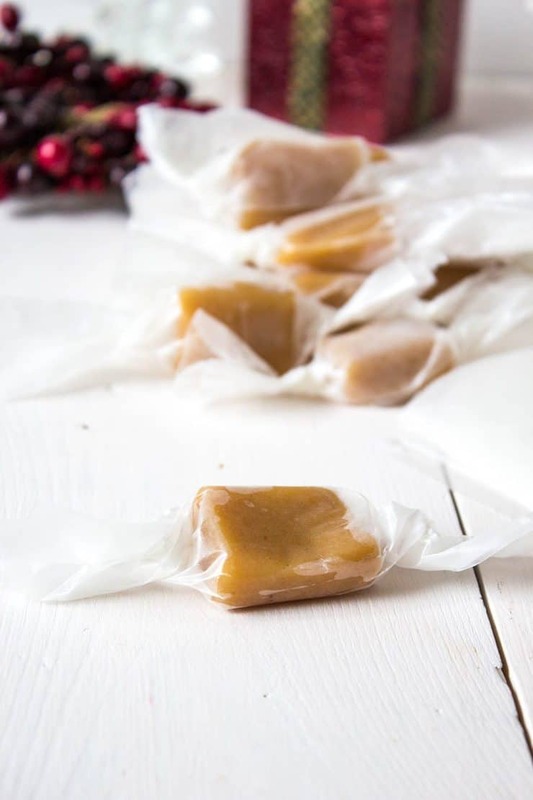 I’m not as diligent as my mom, but I do try to make at least one batch of this homemade caramel every year. These caramels aren’t hard to make. The toughest part is knowing how long to cook them. You can either use a candy thermometer or the cold water test. I always use the cold water test. It’s super simple. You simply drop hot boiling caramel into a glass of cold water. You test the texture of the caramel with your fingers to see if it’s done. 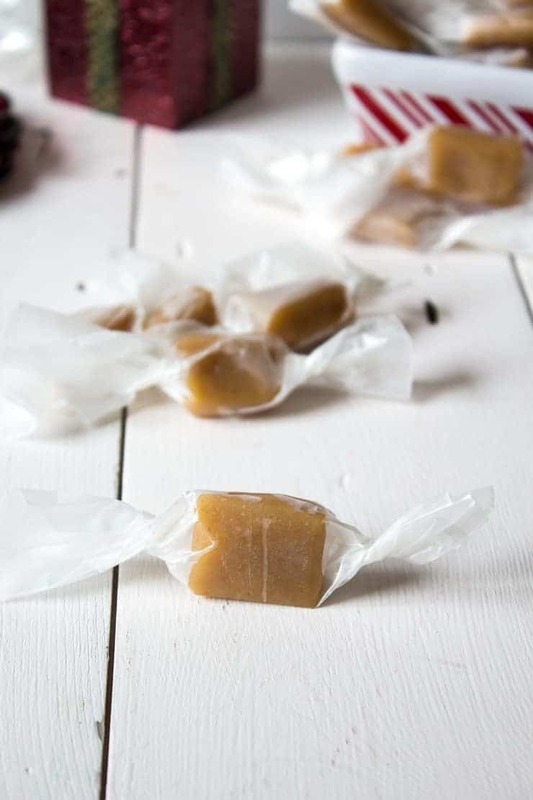 To make these caramels, you put all ingredients, except for the vanilla in a saucepan. Cook over medium heat, stirring often After the mixture comes to a boil, you continue stirring for 5-10 minutes. The actual time varies depending on the size of your burner, the type of pan you are using and the type of heat (gas or electric). After 5 minutes of boiling you will want to start testing the caramel to see if it’s done. Take a small glass of cold water. Drop a small amount of boiling caramel into the glass. Let set for about 10 seconds. Reach into the glass with your fingers, pull out the caramel and test the texture. If it forms together and holds its shape, it’s done! If you use a candy thermometer you will boil until mixture reaches 245 degrees. Butter a baking dish. I use a 9 x 13" pan. In a sauce pan, place all ingredients except vanilla. Place over medium heat, stirring until all ingredients are melted and combined. Continue cooking over medium to medium low heat until mixture boils. Stir every few minutes to avoid scorching. If using a candy thermometer, boil until temperature reaches 245 degrees. If not using a candy thermometer, begin testing caramel in a glass of cold water after 5 minutes of boiling. Drop a small amount of boiling caramel into a glass of cold water. Test caramel with fingers. 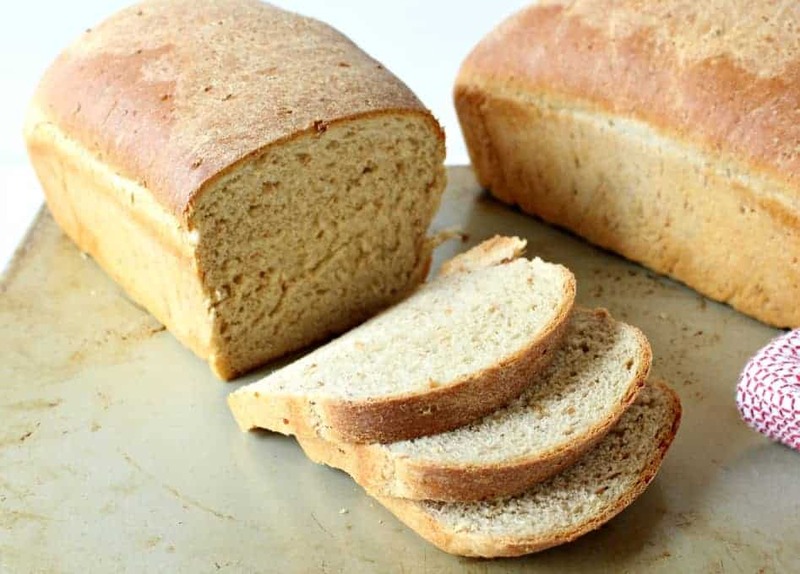 It should retain its shape and not flatten out, but should still be soft. 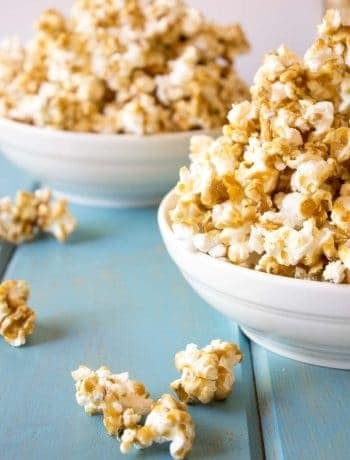 Remove caramel from heat. Stir in vanilla. Immediately pour caramel into prepared pan. When caramel has cooled, remove from pan. Slice into strips and then into individual pieces. 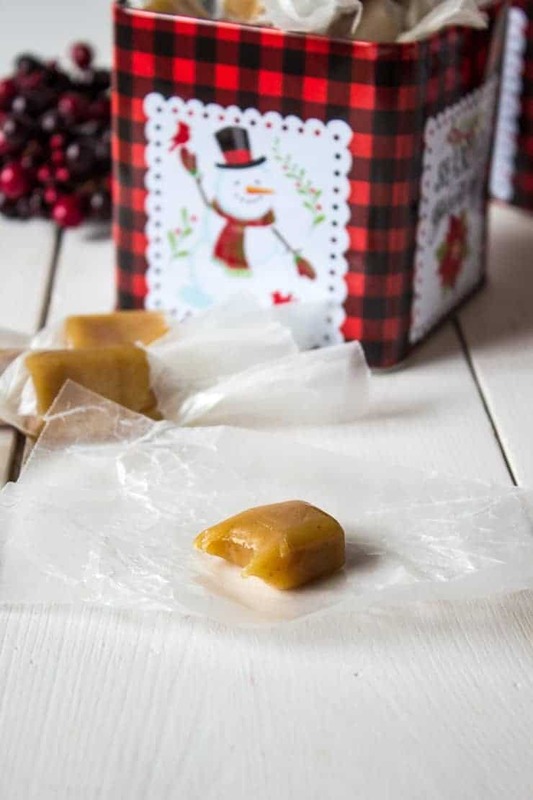 Wrap each piece of caramel in a piece of waxed paper. Please use caution when cooking caramel. It is extremely hot. To remove from pan, use a knife to loosen sides of caramel from pan. Invert baking dish over a plastic cutting board. Allow caramel to slide from pan. If caramel doesn't want to come out of pan, place dish in microwave for 30-45 seconds to slightly warm dish and caramel. Invert dish over cutting board. Caramel does need to be individually wrapped or it will become hard. 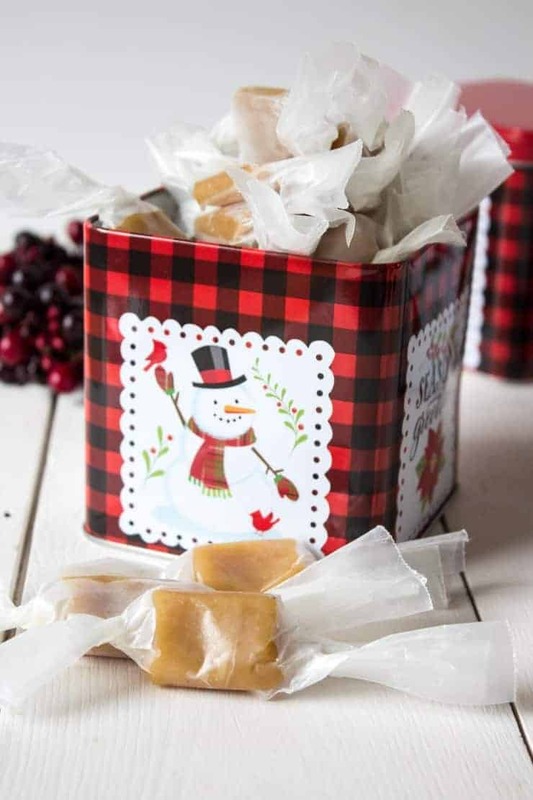 Homemade caramels are definitely a fantastic gift! Wishing you and your family a magical holiday season!! I remember such homemade caramels from my childhood as well, I wasn’t much into sweets then but I loved these one. It never occurred to me to make them myself, but what a great idea! My kids would love them! Thanks for the tip on the ‘water test’- I wasn’t familiar with that. Even though this type of candy might ‘wreak havoc’ on my dental work, I might give this recipe a go! Merry Christmas! This is a family tradition I’d love to start! Nothing like sweet chewy caramels! Wonderful! 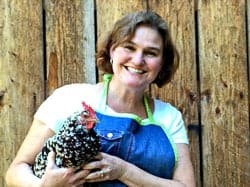 I will warn you – eating them all is totally possible! Not that I’ve done that or anything 😉 It’s best to give them away right away or they do disappear and then you have to make another batch. I can see why these are a tradition! They look like perfection and would make a wonderful gift! Take care. Ummmmm yes please . Caramel is LIFE. These are awesome! Thanks! I can tell you are a true caramel lover! Caramels are a holiday tradition at our house too Kathy! I make some for us to enjoy and make tons for gifting! My favorite! 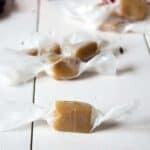 Oh I love homemade candy…and these caramels look so delicious, I have got to try this. 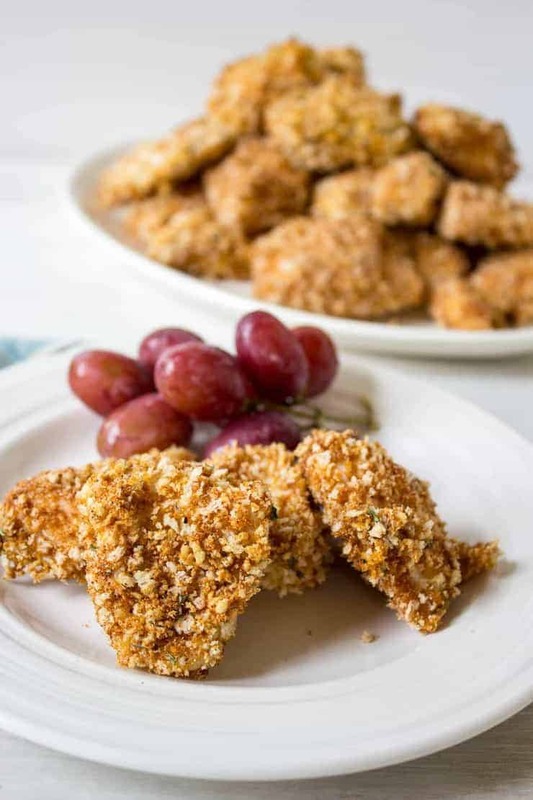 Oh yum Kathy, these look delicious plus they look dangerously easy to make! 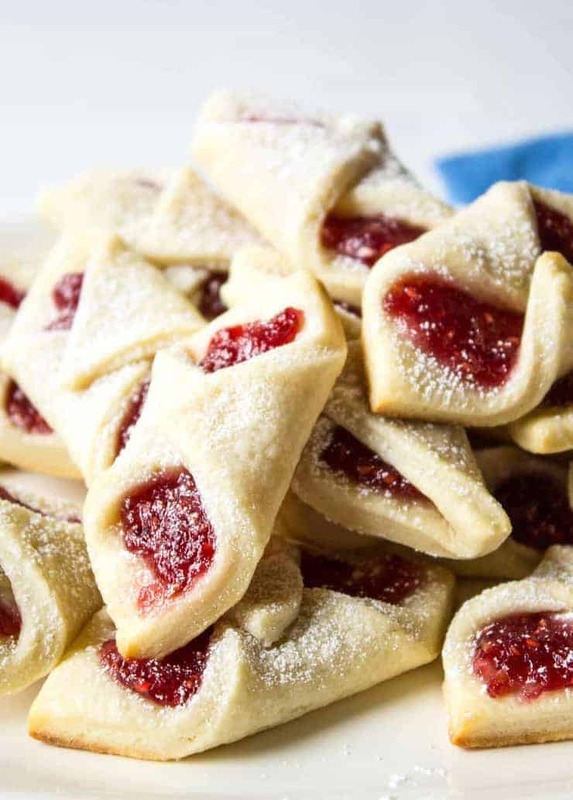 They are just about everyone’s favorite! 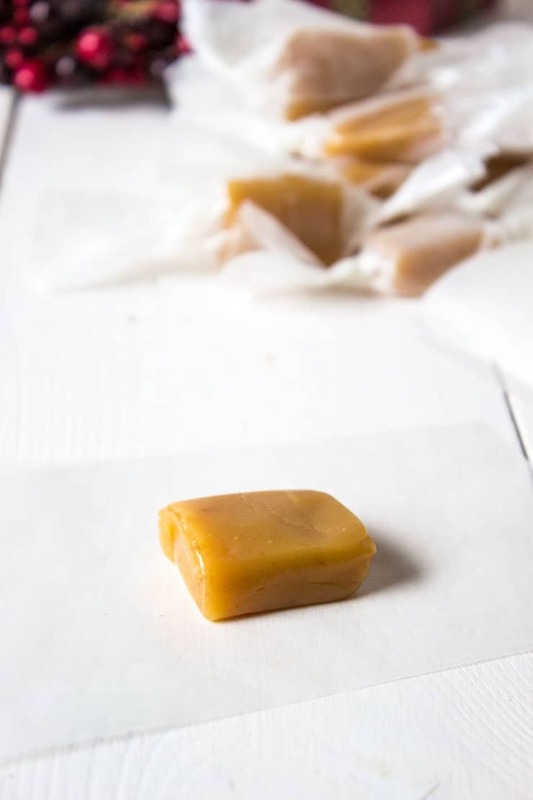 You just can’t go wrong with a soft chewy homemade caramel!